A trust seal is an image you can display on your web site to boost visitor confidence and trust and increase sales or conversion rates. In order to display a trust seal, a third-party organization will typically need to verify that your business is legally registered, that you follow good security practices, or that you have and practice privacy protection. Most SSL providers include a free trust seal when you purchase an SSL certificate. In addition, there are several other kinds of trust seals that can cost up to $2000 per year. But do they actually help to increase trust and (probably more importantly) sales? There are essentially three types of trust seals: Privacy Seals, Security Seals, and Business Seals. Depending on your site, you may benefit from having all three types of trust seals included on your site. TRUSTe is the leading provider of privacy trust seals and there are several studies showing that their trust seals are effective at increasing conversions. Because of this, their seals can cost a lot ($1900 and up) and may not be viable for smaller businesses. Security trust seals signify that the site has been verified to be secure in some way. There are basically two types of security seals: One that indicates that the site uses an SSL certificate and one that indicates that the site has been scanned for malware. If your site needs an SSL certificate, you will usually receive a trust seal when you buy a certificate. Some SSL providers’ trust seals are more well-known than others, and you can expect to pay more for the brand recognition. For example, you are likely to increase visitor trust more by using a Symantec certificate than a GoDaddy certificate, but you may pay up to $1500 more for the VeriSign certificate. Some providers, including VeriSign, now offer their trust seal without having to buy an SSL certificate. Malware protection seals are offered by many different providers including McAfee (their Hacker Safe trust seal is the most popular but can cost around $1900), VeriSign, Qualys, and Trust Guard. Keep in mind that having a secure website involves much more than SSL and malware scanning so these seals only give a small glimpse into the security of a web site. Visitors may not know all that is involved in securing a site but you, as a web site developer, need to. All the site seals in the world won’t make a difference if someone steals all your customers’ data and thrashes your reputation. Business seals typically verify your business identity and verify your reputation as a business. If you like to make your customers angry, you may not be able to get this type of seal. The most common business trust seal is offered by the Better Business Bureau. There are also similar services offered by companies like RatePoint that allow you to capture user feedback and manage your reputation. Now to the most important question: Do trust seals actually work to increase trust or conversion rates and by how much? Of course the trust seal providers would want you to believe that they will work miracles on your site. In fact, most of the studies available demonstrating their effectiveness are published by the providers themselves. For example, a recent press release from VeriSign/Symantec claims that MyEnergySolutions.com increased registrations by 137% simply by using the Verisign Trust Seal. Verisign has published several similar Trust Seal case studies demonstrating very radical increases in conversions. These should clearly be met with skepticism. Even if they are accurate tests, they are likely edge cases that don’t represent the increase that most sites would see. Are there any unbiased studies proving the effectiveness of trust seals? Unfortunately there are very few. A few webmasters have reported on their own results of using trust seals and there have been a few academic papers on the subject (Myth or Reality: Effect of Trust-Promoting Seals in Electronic Markets). They indicate that trust seals can have a very positive effect on trust and conversion rate. However, you have to keep in mind that the increase in conversion rate will vary depending on the type of site, its popularity, the products being sold, the trust seals used, and a host of other factors. 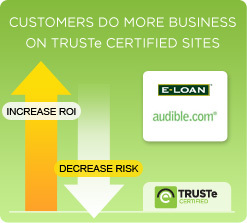 For example, a new site isn’t likely to benefit much from trust seals until it has a substantial amount of sales. Most studies seem to indicate that a conversation rate increase of 2-15% is considered realistic. Your best option is to try a couple of trust seals and perform an A/B test to determine their effectiveness on your actual site with your actual visitors. Be sure to follow the tips at Trust Seals Collection and How to Use Them to Increase Conversion Rates when performing the test. Trust seals come in several different flavors including privacy trust seals, security trust seals, and business trust seals. Each has different requirements and costs. Studies and testing from webmasters indicate that trust seals do have a good chance of increasing visitor trust and conversion rate. There are many factors that affect how effective a trust seal will be and you should do A/B testing to determine its true value to your site. Trust seals (even security trust seals) do little to make your site more secure. You need to take many other measures (including SSL, secure payment processing, secure coding, and server maintenance) to ensure that your site stays secure.